Eileen was the mother of Ainslie Mills (Oriana Perm. Reg.) and her brother Brent, and mother-in-law of Louise Battley (Tashora Reg.) Born in England, she came with her parents to Winnipeg at a young age and moved her family to Vancouver, B.C. in 1959 due to her husband Winston’s health. She was a musician, soprano soloist, voice and piano teacher, organist and choir leader in her professional life. She overcame polio in the early 1950’s outbreak, an example of her determination when she set her mind to something. Eileen came to the Golden world relatively late in her life and was very proud to be a Life Member of the GRCBC. She always committed herself fully to any undertaking and her contributions to the GRCBC and the Golden fancy were many. She held executive office, helped with the newsletter, worked on Committees, managed the Club pins, chaired special events and seminars, attended mall displays, volunteered for Canadian Guide Dogs for the Blind and was a friend and supporter of many in the dog world. Her real love was the field and we are sure all that fresh air and exercise helped keep her in such good shape for so long. She reminded us that it is never too late and you are never too old to get involved and have some fun. 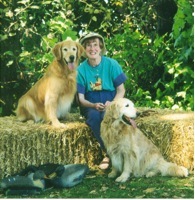 Her dogs achieved some wonderful goals under her guidance. She shared her life with five special Goldens and she treasured each of them. With her potions, vitamins and herbs, along with much love, her dogs all lived long and healthy lives.